The people dependent for sustenance on Delhi's largest green belt, "the Ridge", are trapped in the power-grabbing crossfire between the Delhi Administration and various other agencies. 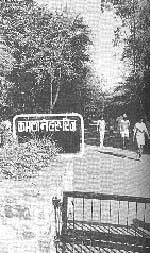 The Delhi Administration's environment and forest department has decided to convert the Ridge into a reserved forest and has locked horns with the Delhi Development Authority (DDA) over the control of the Capital's forests. Most of the 7,777 ha of the Delhi Ridge have already been encroached upon to create parks, schools, residential areas or have been given away as police and military allotments. The worst-affected areas are the northern and central sections of the ridge. Of the original area of 120 ha in the north, 34 ha have been lost, and 63 ha of the central section's 917 ha are irrecoverable. The belated demarcation and fencing of whatever remains of the Ridge is now on. How, and how far, reserving the Ridge would affect the people's right is yet to be assessed. Says S Khanduri, Delhi state's conservator of forests, "Various sections of the Ridge have been declared reserve forests from time to time but the settlement of rights of the people are not available. Therefore, it is difficult to indicate the extent to which people are dependent on the Ridge for their basic needs."